due to FDNY activity traffic on Main st. will be delay temporarily. Roosevelt Island Manhattan Box 1945, Bn-45 using 2x2 for a car fire, 3rd floor of Collar/Goldwater Hospital parking garage. @fdnyincidents: Roosevelt Island Manhattan Box 1945, Bn-45 using 2x2 for a car fire, 3rd floor of Collar/Goldwater Hospital parking garage. Fire in the Motoparking garage on Roosevelt Island. Traffic on Main St. is back to normal. A driver noticed smoke and small flames coming from their own vehicle. FDNY extinguished the fire. There were no injuries and there was no damage to Motorgate or other vehicles. For those of you I haven’t yet met, I’m Cathy Dove, Vice President of Cornell Tech and a resident here on Roosevelt Island. Together with Dean Dan Huttenlocher, I’m very excited to be leading Cornell’s efforts to develop our new tech campus. I’m going to be using this column to periodically update Islanders on our vision, plans and progress. It’s hard to believe that it has been less than a year since the City selected Cornell to build an applied sciences campus that will introduce a new graduate tech model and grow the tech sector in New York. Since January 2012, we have been in true “start- up” mode; hiring employees, finding space, and all the while ramping up plans for our future campus on Roosevelt Island. In the last few months, we’ve hired star faculty, moved into our temporary campus space donated by Google in Chelsea, launched a unique partnership with the U.S. Department of Commerce and begun accepting applications for our “beta” class of computer science students, which will start in January. In addition to these very visible activities, we’ve also been hard at work behind the scenes. On the academic side, together with our academic partner Technion, we’ve been designing a distinctive model of graduate tech education that will closely connect academia and industry to spur innovation and economic growth in New York City and beyond. In addition, we’ve also been spending a great deal of time crafting a campus plan for the Roosevelt Island site that will guide our project over the coming years, conducting a very thorough environmental review, and creating early design concepts for the first academic building. I am pleased that the appropriate city agencies have agreed that our planning is at a stage where we can now share this material with the community. This week we officially launched the seven-month public input process known as ULURP. Ever since Cornell was chosen by Mayor Bloomberg in December to build the campus, we’ve been working hard to meet with as many members of the community as possible, and that effort will only intensify now as we begin official hearings with the community board, borough president, city planning commission and finally the full city council. We’re very much looking forward to a full dialogue on all aspects of the plan. You can see current renderings of the campus here on Roosevelt Islander Online. Our goal is to create a publicly-accessible campus that stitches the Island together, connecting to the open space and circulation systems on the north and to the parks, Southpoint and Four Freedoms, on the southern tip of the Island. A central pedestrian path will welcome Islanders from the northwest corner of the campus, winding through the campus buildings and into a series of active public open spaces offering breathtaking views of the Manhattan and Queens skylines. The campus will feature a river to river experience, with open spaces pulling people in from the esplanade. The buildings will be social and welcoming, with public spaces on the ground floors, including a public café in the academic building that spills out into the open spaces. We want the campus to be a great new amenity for Roosevelt Island residents, a place that feels part of the community. The elements of each phase of campus development are being designed to connect academia with industry to spur innovation and entrepreneurship, economic development, jobs and a growing tech sector in New York City. The first phase, due to open in 2017, will include all of the activities necessary to make the campus feel whole from day one, including an academic building, a residential building for students and faculty, a corporate co-location building for startups and tech companies looking to collaborate with the campus, and an executive education center with hotel facilities. Design work is already underway on the first academic building by Pritzker Prize- winning architect Thom Mayne. We aspire to make this a net-zero energy building, one of the largest of its kind in the country. We are evaluating a number of ways to generate the energy needed to achieve this unique level of sustainability, including a canopy of solar panels that would be an exciting design feature in addition to serving an important function. I think you’d agree it’s the type of bold thinking that has always been at home here on Roosevelt Island. This is an exciting time for Cornell Tech as well as for Roosevelt Island. We still have a long way to go before breaking ground in 2014, but the process is well underway. The first of many opportunities to hear more about all the details of the campus plan is coming up at the Community Board 8 meeting on October 22. I hope to see you there or at one of the other meetings during this review process. I’ll be back soon with another update on our progress and more information about Cornell Tech. I just attended the dedication ceremony for Four Freedoms Park, and both the Park and the ceremony were simply magnificent. It was an absolute pleasure to have Tom Brokaw as a Master of Ceremonies and hear President Bill Clinton, Mayor Michael Bloomberg, Governor Andrew Cuomo and Ambassador William J. Vanden Heuvel address the captivated audience. The Four Freedoms Park team, the RIOC Board of Directors and RIOC staff all did an outstanding job in working cooperatively to get this done. I encourage the community to take the opportunity to see the Park on Saturday, October 20, which is Roosevelt Island Residents’ Day at the Park, featuring an Open House for resident preview from 10:00 am to 3:00 pm. Earlier this week Cornell University unveiled new renderings of its future campus, which will be located on the southern part of Roosevelt Island. The designs are the most detailed we have seen to date and confirm Cornell’s commitment to an open campus that integrates the rest of the Island and New York City with the campus. For example, the renderings show a pedestrian walkway connecting an outdoor plaza and a green esplanade that offer wonderful views of Manhattan, Queens and the East River. RIOC is thrilled that the plan calls for a series of gorgeous public areas that will be open to Island residents and visitors, and a public café on the main academic building's ground floor that will run into the courtyard. The net-zero energy academic building, with its rooftop photovoltaic canopy, is in line with previous green technology innovations on Roosevelt Island. We look forward to continuing to work with Cornell as their exciting vision becomes reality. We are very pleased to note that, as result of several years of negotiations, Island House, a 400-unit affordable housing development on Roosevelt Island, will continue to remain affordable to its residents for the next 30 years. The Island House deal is historic in nature and marks the first successful conversion of a State Mitchell-Lama rental to affordable home ownership as a solution to a market-rate exit from Mitchell-Lama. 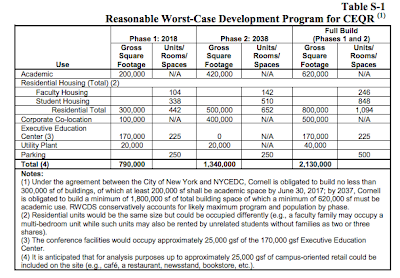 Without the State’s intervention in extending affordability, apartments within Island House, a development at the threshold of leaving the Mitchell-Lama program, would have been allowed to be rented at market rates, severely affecting residents. The Affordability Plan was initially drafted and agreed upon by the Island House owner and tenants. The Plan was later approved by a multi-agency working group that included: RIOC, which administers operations on Roosevelt Island; New York State Homes and Community Renewal (HCR), the State’s housing agency, which administers both the Mitchell-Lama program and the State’s rent laws; and Empire State Development (ESD), which in 1969, as the Urban Development Corporation, first leased the land under Island House from the City of New York. The Affordability Plan was the result of several years of negotiations among the agencies, the Island House Tenants Association, and owners’ representatives. Our last Island event, the Fall for Arts Festival, was a smashing success with over 2,000 people in attendance! We would like the Parade & Extravaganza to be just as successful (if not more), and hope to see you there! The United States Military West Point Band performed last Wednesday at the Roosevelt Island FDR Four Freedoms Park Dedication Ceremony. 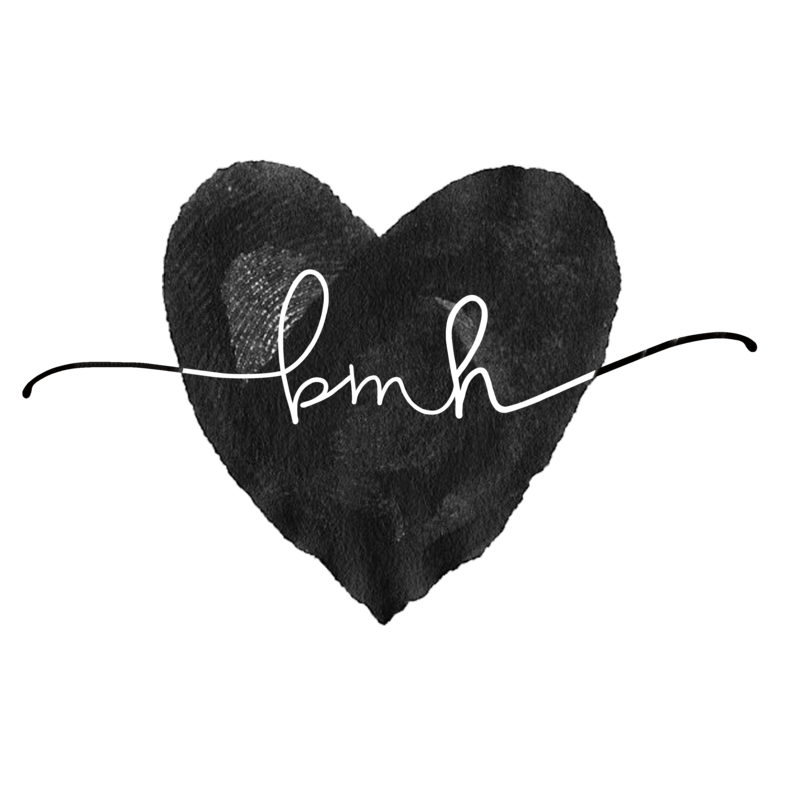 Take a look and listen. The Superintendent of West Point Lt. Gen David Huntoon attended the Dedication and is pictured below greeting former President Bill Clinton. ... With the establishment of the United States Military Academy in 1802 came an increased demand for military music. As the academy grew, it needed fifers, drummers and buglers to drill the new cadets and provide an audible order to their duty day. In 1817 the ensemble was named the “West Point Band,” and by this time was performing on a full range of instruments, which included two bassoons, two Royal Kent bugles, a tenor bugle, ten clarinets, three French horns, a serpent (an early bass horn), cymbals, a bass drum, eight flutes, and two trumpets. and one of the Band Members prior to playing on Roosevelt Island. More on West Point Band here and full Dedication Ceremony here. Four Freedoms Park is not open to the public yet, but because you're a resident of Roosevelt Island, you are invited to a special preview. This Saturday, October 20, we're hosting an exclusive open house just for you. From 10 am to 3 pm, the Park will be open to residents of Roosevelt Island, as well as any friends and family you'd like to bring with you. The Child School/Legacy High School Chorus will perform. Join us on Saturday to celebrate the completion of the memorial to Franklin D. Roosevelt at this exclusive event in advance of the public opening. For more details, please see the formal invitation below. To prepare for your visit, explore our new website and learn about Park architect Louis I. Khan and the Park's thirty-nine year history. Was the PS/IS 217 chorus invited to perform at this event? If not, why was the Child School chorus selected to perform instead of a local Roosevelt Island Public School made up of local Roosevelt Island kids? Any reason why both could not perform? RIOC had no involvement with creating the program for Saturday's event. I asked Four Freedoms Park for a comment but have not heard back yet. Will include any reply later as an update. Franklin D. Roosevelt Four Freedoms Park is a Presidential memorial. We ask you to follow these rules to preserve the sanctity of this place. To keep the memorial clean for all to enjoy, please carry out what you carry in. Thank you for honoring this shared public space. and some more scenes from the October 17 Big Wig Dedication Ceremony. The FDR Four Freedoms Park is scheduled to open to the public on Wednesday October 24. The Child School Chorus is the only local group performing tomorrow. 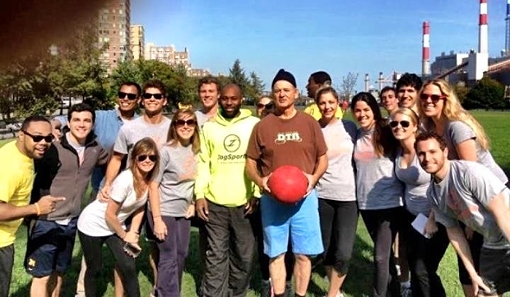 They offered to participate and we accepted. and her students in the future. Charles DeFino, Executive Director of the Roosevelt Island Youth Program announced today the beginning of the Youth Programs community initiative to inform youth and their parents about Breast Cancer Awareness Month (BCAM). BCAM, also referred to in America as National Breast Cancer Awareness Month (NBCAM), is an annual international health campaign, organized by major breast cancer charities and local community groups every October to increase awareness of the disease and to raise funds for research into its cause, prevention, diagnosis, treatment and cure. The campaign also offers information and support to those affected by breast cancer. 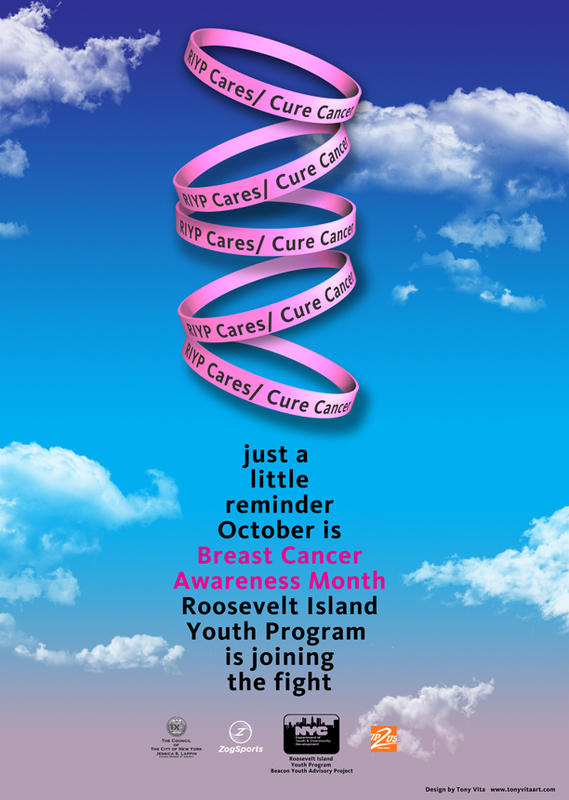 This Saturday October 20th, the Roosevelt Island Youth Program Soccer League will give out RIYP Cares/Cure Cancer bracelets for all the players to wear during their games and their coaches will explain the significance of having the players and families wearing them. This event has been organized by the Beacon Youth Advisory group with our Coaches Across America, Nike/ UP2US Americorps worker Andre Ganeev and Lucy Leon and Sandra Mollette of the Roosevelt Island Youth Program Beacon. The Beacon is made possible by the grants of the Department of Youth and Community Development and the additional support of the Roosevelt Island Operating Corporation, Americorps, Nike Corporation and donations from Zog Sports and of course our Councilperson Jessica Lappin. The Roosevelt Island Youth Program will also be selling charm bracelets to raise money for the American Cancer Society, bracelet will be available at the Youth Center at 506 Main Street, all Soccer games at Octagon field and by calling the Roosevelt Island Youth Center at 212-935-3645, the bracelets are $5.00 apiece, so please help us help. 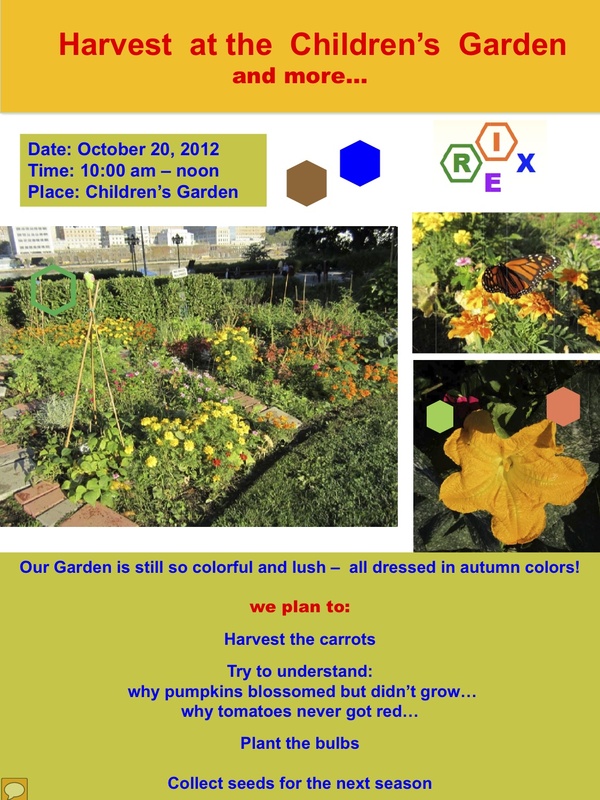 We plan to have a “harvest” in our Garden on Saturday. In addition to harvesting our carrots, we shall also plant some bulbs and make flower bouquets, which we intend to share with anybody who stops by - We hope to have a fun and bonding event. The Garden is located on the lawn between 455 and 465 Main Street near Starbucks. The Harvest takes place between 10 AM and noon. 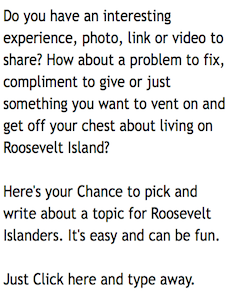 More information on the Roosevelt Island Explorers from their web site and previous post. 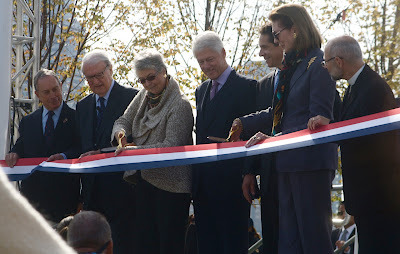 Reported yesterday on Scenes from the Roosevelt Island Kahn/FDR Four Freedoms Park Memorial Dedication Ceremony. and Photo Blogger Olya Turcihin (Olya's Urban Journal). 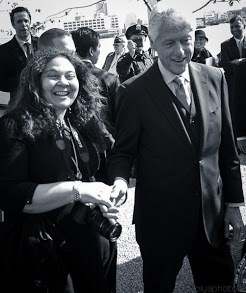 I managed to offer to take President Clinton on a tour of Roosevelt Island which he politely declined and then told him about the FDR Hope Memorial. 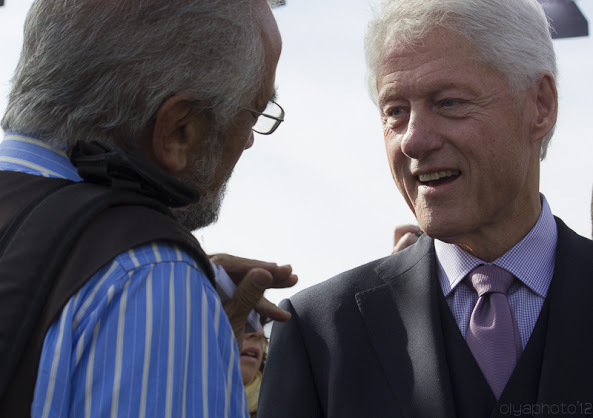 President Clinton explained that he always wanted to visit Roosevelt Island after reading Linda Fairstein's novel The Deadhouse. Ms. Fairstein is standing at President Clinton's left as we spoke. 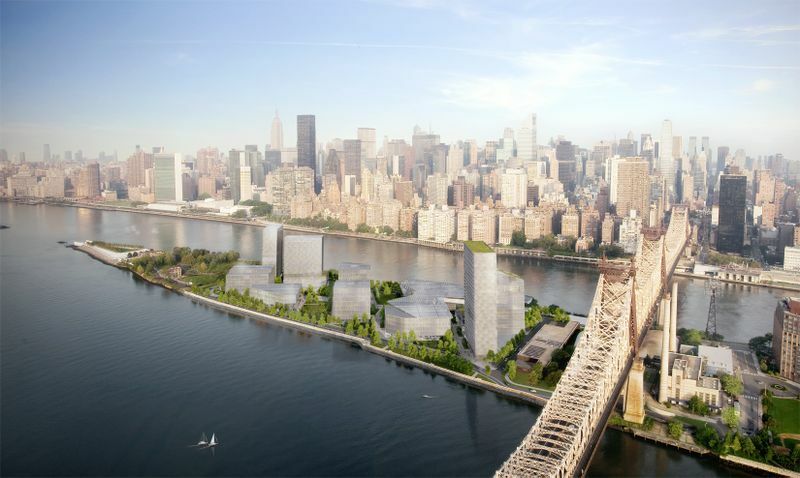 as well as the changes soon to happen with the arrival of Cornell NYC Tech and FDR Memorial. ... This incomplete version of Roosevelt Island is often forgotten when stories are written about how the island is "finally" being finished. But if progress is counted in high-rent high-rises of questionable architectural provenance, then the building I lived in, designed by Josep Luis Sert according to the latest principles of efficient design and as part of a utopian architectural vision of the future, is a sort of regression I can get behind. I was, like many Islanders present and past, perpetually grumpy about every new building that went up. The reason today is a good day for those of us who love Roosevelt Island is because a different kind of change is taking place there now, one more in tune with the spirit of the place. It's something interesting, futuristic, and idealistic. And that's really what that strange island has always been all about. Click here for the entire Capital New York article on Roosevelt Island. I've shown this video before, but here's what Roosevelt Island was like in 1980. Are WIRE Building Vertical Patrols Being Conducted As Claimed By Roosevelt Island Public Safety Department? None of the committee members present stated that they had seen vertical patrols being conducted in their buildings. Members acknowledged that PSOs were seen at the door station in Westview during the summer months, and is the 595 Main Street lobby as well, but not seen on the floors or in the stairways. Island House leaders stated similar experiences. Rivercross representative stated that he had not been seen PS Officers patrolling the building recently. I had similar experiences: I haven't seen a PSO (Public Safety Officer) patrolling the floors in Island House in the past 5-10 years. As reported above, I had similar experiences seeing PS only at the 555 doorstation or the 575 lobby, not patrolling the building. As a follow up to Steve Chironis' letter dated February 14, 2012, this letter is to serve as further explanation to the services provided to the WIRE buildings by the Public Safety Department of the Roosevelt Island Operating Corporation. In addition to external patrols, the Public Safety Department provides internal patrols of the buildings at a minimum of one patrol per eight (8) hour shift. That is at a minimum three times during a 24 hour period. Internal patrols include check of all hallways, stairwells and entrance/exit doors, as well as making sure all apartment doors are locked, secured and free of vandalism (i.e., graffiti). A couple weeks ago I asked one of the doorman to look at the log book. On the pages I reviewed (which covered several months) I saw that virtually every day lacked a three-per-day patrol ... typically one or two patrols a day, and some days had NO patrols. All of the patrols were short, approximately 20 minutes. Having distributed flyers in the building many times, it takes about 40-45 minutes to cover every floor (Westview residents have similar timings). In some cases, two patrols are being done back to back (3 PM and 4 PM) so the building goes unpatrolled for 22 hours at a time. I asked several doormen across several shifts if they had seen Public Safety patrolling the building or observed them via security cameras. All doorman said they saw the officers at their doorstation, but did not see him elsewhere in the building (i.e., outside of the 555 and 575 lobbies). In short, the Public Safety Department is not giving us the service they promise (not enough patrols, inadequately performed, etc. ), it is a safety issue, a contractual issue, and a cost issue for us tenants. To me, this seems like fraud: if someone were billing 40 hours for a week's worth of work and only actually doing half, we would call that fraud, right? On Saturday, consistent with prior observations, I saw a PSO check in at the doorman around 8:10 PM, and then check out around 8:30 PM -- not enough time to patrol the building. He was filling out an Activity Report. How can that Activity Report be truthful or complete if the PSO didn't actually patrol the building? Isn't that Activity Report fraudulent? And why does PSD supervisors believe this is acceptable? This appears to be a widespread and lengthy problem at Public Safety: the problem exists at a supervisory and executive levels (who schedule the officers, and they don't schedule them properly) and at the officer level (because the officers themselves aren't doing the patrolling they claim to be doing). Mr. Guerra's assertion of PSD performance (Exhibit H) is significantly misleading because: (1) PSD does not do the patrols they promise, (2) the patrols they do are incomplete and inadequate, (3) they represent they do complete performance for other WIRE buildings (other than Island House) when, in fact, they do not do such performance. This requires an investigation on what kind of performance PSD has provided (so tenants can get a refund), and requires a top-to-bottom investigation of the management structure of Public Safety. I encourage you to look at logs books, security video in WIRE buildings, and so on to verify PSD's lack of performance. I note that when speaking with residents, I have heard second hand from PS officers that some staff is "family", "connected", and such. I looked into this and found out that Mr. Guerra and Mr. Martinez are fraternity brothers (a year a part), and there might be other relationships among the staff. Investigators should use appropriate care. We appreciate Mr. Farance expressing his concerns. We are looking into the issue. More on Roosevelt Island Public Safety Department Vertical Patrols from these previous posts. 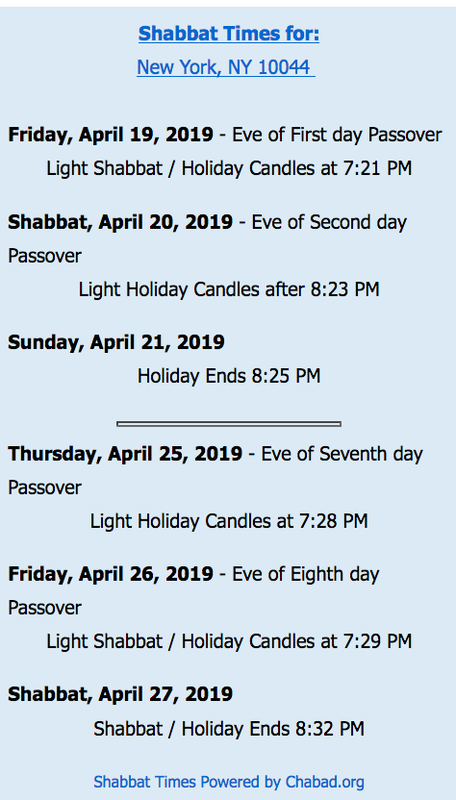 Check out the website event listing here! The 5k is an opportunity for you to show support for promoting human dignity in policy and in culture. Run for Dignity t-shirt included with registration! View a full course map by clicking here. The Run for Dignity is part of the Emerging Leaders Conference: Person-Centered Sustainable Development. Will have more later, but here are some scenes from the FDR Four Freedoms Park Dedication earlier this afternoon morning. Governor Andrew M. Cuomo today announced the opening of Franklin D. Roosevelt Four Freedoms Park, a new State Park located on Roosevelt Island in the East River. Four Freedoms Park is an enduring tribute to the life and work of President Roosevelt, a former governor of New York State who led the nation through a tumultuous period in American and world history. The Park will open to the public on October 24. "With the opening of the Franklin D. Roosevelt Four Freedoms Park this fall, New Yorkers and visitors from around the world will have a memorial to recognize a great leader and native New Yorker who led our nation out of the Great Depression and steered America to victory in World War II," Governor Cuomo said. "New York's state parks are a true treasure, and the addition of Four Freedoms Park will give the park system yet another location for visitors to enjoy the outdoors, while also paying tribute to President Roosevelt. I encourage New Yorkers to visit Four Freedoms Park and learn about the remarkable life, work, and vision of President Roosevelt, from his time as governor leading the Empire State to his steady hand guiding our nation as president." The last design of the iconic American architect Louis I. Kahn, and the only design by Kahn in New York City, the four-acre Park is a major new addition to New York’s cultural and public life. The park features a granite plaza at the southern tip of Roosevelt Island, tree-lined paths and a bronze bust of Roosevelt by acclaimed portrait sculptor Jo Davidson. Rose Harvey, Commissioner of New York State Parks, said, "New York State Parks are celebrated for connecting people to the most important and inspiring natural, cultural and historic treasures in the state. Four Freedoms State Park builds on this legacy, highlighting President Roosevelt’s remarkable vision of freedom at a critical moment in history and the artistic design of legendary architect Louis I. Kahn." 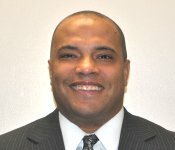 Darryl C. Towns, Commissioner/CEO of New York State Homes and Community Renewal (HCR), who also chairs the Roosevelt Island Operating Corporation, said, "Roosevelt Island has long deserved a park worthy of FDR, the island's namesake. Four Freedoms Park will serve as a powerful reminder of President Roosevelt's legacy, as well as that of the Greatest Generation who served under him in order to preserve our freedoms." Sally Minard, President of Franklin D. Roosevelt Four Freedoms Park, said, "The Four Freedoms are as important and relevant today as they were when President Roosevelt first articulated them in 1941. The Park expresses these fundamental elements of modern democracy in a setting that is truly unique." The Park has been decades in the making. Governor Nelson Rockefeller and Mayor Lindsay announced the project in 1973, appointing Kahn as its architect; Kahn died unexpectedly shortly after completing the Park’s plans and the City of New York’s financial troubles dampened momentum for the project. More than 30 years later, former Ambassador to the United Nations William vanden Heuvel and the Four Freedoms Park Conservancy spearheaded a philanthropic effort to revive the park, enabling construction to begin in 2010. The park derives its name from a January 6, 1941 speech delivered by President Roosevelt, in which he described his vision for a world founded on four essential human freedoms: freedom of speech and expression, freedom of worship, freedom from want, and freedom from fear. You can take a walk around the park too. Will have video of the entire ceremony later. UPDATE 5:45 PM - Roosevelt Island Photo Blogger Olya Turcihin (Olya's Urban Journal) shares these great photos she took at today's FDR Memorial Dedication. UPDATE 4/19- More here including video of entire dedication ceremony and video interview with President Clinton talking about Roosevelt Island. ... Our charcoal-grill gives our burgers and dogs a flavor that transports you to a backyard BBQ on a warm summer day, even if you’re just on your lunch break. Our classic menu items are made fresh on the spot with quality, locally-made ingredients including grass-fed, NY-state beef from Dickson’s Farmstand Meats, organic all-beef hot dogs from Brooklyn Bangers, artisanal pickles from Rick’s Picks and regional cheddar. 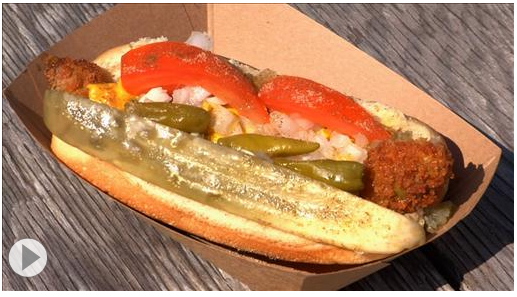 In addition to delicious burgers and hand-cut fries, Snap’s menu features a classic Chicago-style hot dog. Order it with “the works” for an entire meal on a bun. Not in the mood for meat? Try the panko crusted avocado fries with our house-made chipotle mayo. 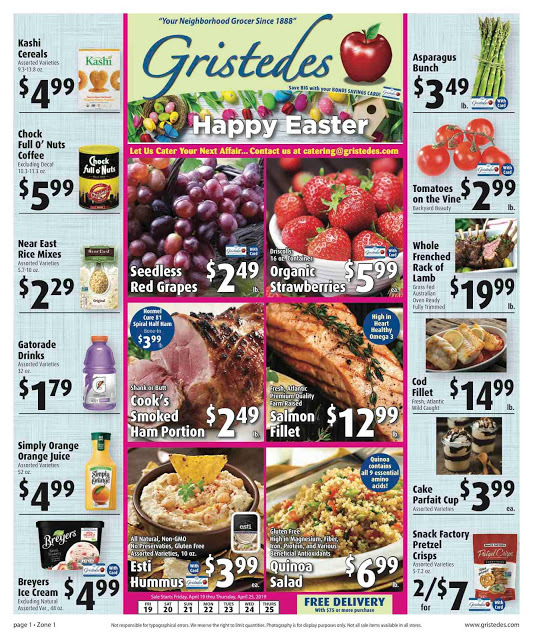 Snap also offers seasonal specialty menu items, so keep an eye on our Twitter feed and blog for new additions. The Snap truck’s engine runs on bio-diesel made from recycled cooking oil. This innovation means the organic peanut oil in Snap’s deep fryers gets filtered into the truck’s gas tank after it’s done making Belgian fries and avocado fries. The truck is literally fueled by fries. This cuts down on the amount of fossil fuels we use and gives our cooking oil a second life. and this Wall Street Journal video. Snap Truck will be here on Friday too. You can also order online and pick up at the Snap Truck. The Roosevelt Island Operating Corp (RIOC) Real Estate Committee (web cast of entire meeting is here) discussed the issue of mobile food vending during their October 5 meeting. During the discussion, it was decided to eliminate the $345 monthly fee and charge vendors $30 per day on a monthly basis for one the three spaces by the subway. As it was explained during the meeting, a food truck vendor could decide it wanted to be here on Mondays and Wednesdays for the month. They would then pay $240 per month (8 days times $30) for one spot and the same applies to any other day of the week. At long last, the first new Roosevelt Island Main Street retailer signed up by Master Leaseholder Hudson Related Companies will have its Grand Opening tomorrow. That's right, Subway Sandwich Shop at 513 Main Street will now be open on Roosevelt Island starting tomorrow. as well as the Child School Arts Center on second floor of 504 Main Street. that was pretty good and the store was crowded at lunchtime. 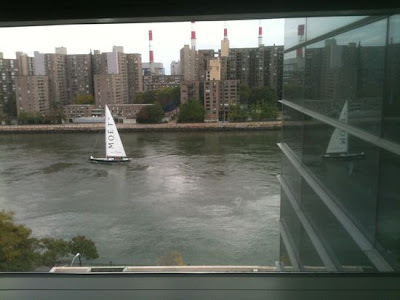 Andrew Sullivan's Daily Dish View From Your Window Of East River Sailboat Passing Roosevelt Island - What's The View From Your Window? Andrew Sullivan's Daily Dish View From Your Window feature is one of my favorites. Yesterday, the view was of Roosevelt Island from across the East River. Here it is. Here's one from Roosevelt Island looking across East River to Manhattan's East Side. and the view from a Manhattan Park web cam. The Cornell NYC Tech Uniform Land Use Review Procedure (ULURP) officially began today with certification by NYC Planning Department. WCBS TV came out to Roosevelt Island yesterday to interview residents on the new Cornell NYC Tech project. Here's what some had to say. More here from WCBS TV. Cornell Tech today enters the seven-month land use review process for its new tech campus in New York City. 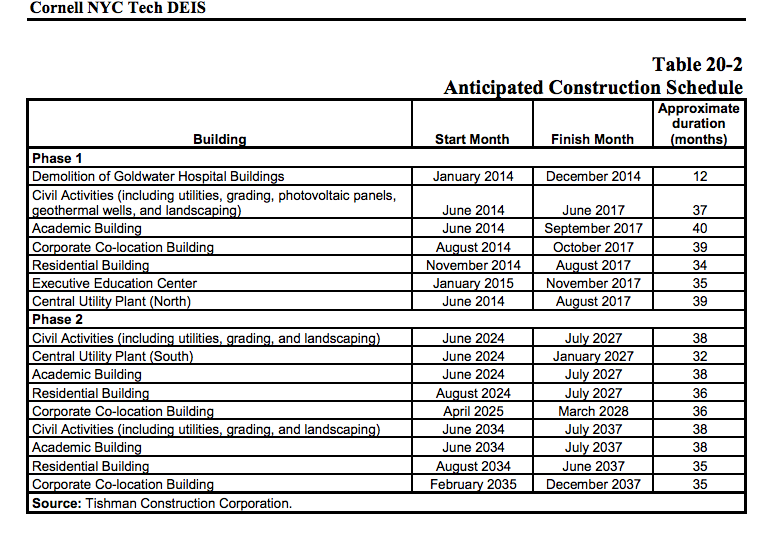 The Roosevelt Island campus will sit on a 12-acre site and is slated to open in 2017, with full build out in 2037. 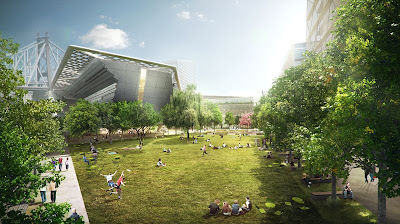 To mark the beginning of the process, Cornell Tech released new images of the campus, highlighted by preliminary renderings of its first academic building with plans to create a net-zero energy development. highlighted by a large public café on the ground floor of the academic building that spills into the open space in good weather. The current plan to achieve net-zero energy for the academic building is via a rooftop photovoltaic canopy that will generate much of the energy needed to make it one of the largest energy-neutral buildings in the U.S. The campus master plan is being designed by Skidmore, Owings and Merrill, LLP, with the first academic building being designed by Pritzker Prize-winning architect Thom Mayne and Morphosis Architects. Construction on Roosevelt Island is expected to begin in 2014, with the first phase of the campus due to open in 2017. The first phase of the campus is expected to include the first academic building, a corporate co-location building, an executive education center with hotel facilities, a residential building for students and faculty and 125,000 square feet of public open space. At full build in 2037, the campus will include up to 2.1 million square feet of development, housing approximately 2,000 full-time graduate students. The start of the public review process for the Roosevelt Island campus is another major milestone for Cornell Tech. The campus is now accepting applications for a “beta” class of computer science master of engineering students, which will begin classes in January in temporary space donated by Google in Chelsea. The campus soon will be launching additional academic programs, is actively recruiting star faculty, developing a distinctive new model of tech entrepreneurship, and designing its permanent campus on Roosevelt Island. Earlier this month, Cornell Tech announced a first of its kind partnership with the U.S. Department of Commerce to bring full-time U.S. Patent and Trademark Office personnel to the campus to promote innovation and economic development. Cornell University, with its academic partner the Technion-Israel Institute of Technology, was selected in December 2011 by Mayor Michael Bloomberg to build the applied science and engineering campus, currently located in Chelsea until the permanent campus opens. The new campus is offering a distinctive model of graduate tech education that fuses educational excellence with real-world commercial applications and entrepreneurship, rooted in the latest academic research. Students, faculty and industry experts will learn and work together to launch ideas and create new ventures that have global impact. The campus will attract the best and brightest in technology, immerse them in an entrepreneurial culture with deep ties to the local business community, and spur the creation of new companies and new industries in New York City. The updated campus master plan and preliminary renderings of the first academic building released today reflect Cornell Tech’s commitment to innovation not only in the academic program for the campus but also in its physical development. 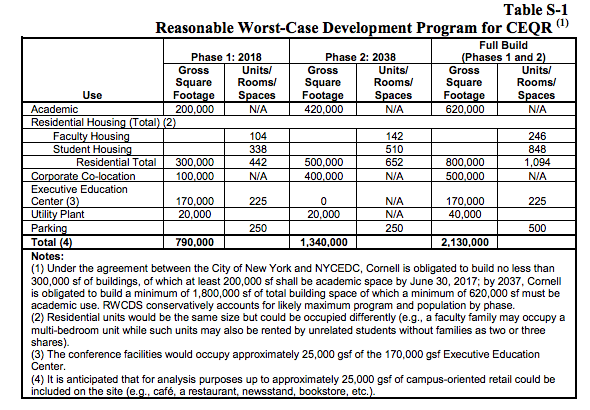 During the October 3 Roosevelt Island Residents Association (RIRA) Common Council meeting, Cornell NYC Tech Vice President Cathy Dove outlined the ULURP Land Use time line for the project. ... As shown in the figure, the Phase 1 buildings, which would include academic, corporate co-location, residential, and Executive Education Center buildings, would be developed in the northern portion of the project site. 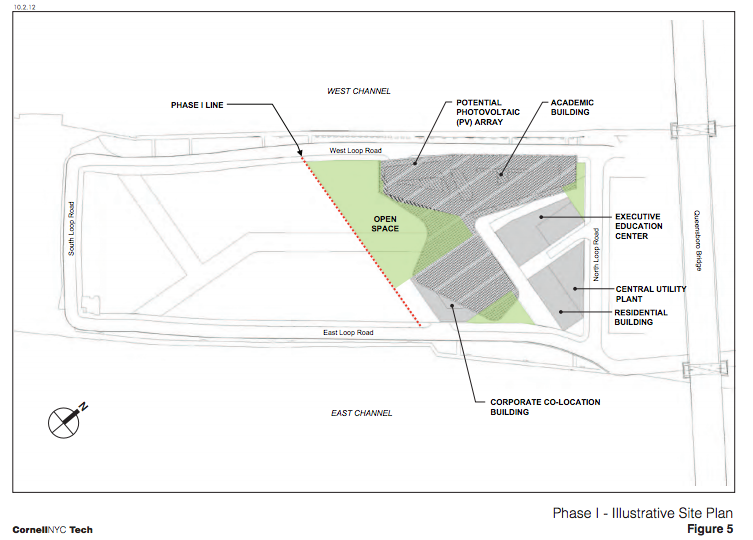 The Phase 1 central utility plant would be located toward the northern edge of the site. A Cornell building for academic purposes. This building is anticipated to be approximately 150,000 gsf in size and could be up to 8 stories in height. At this time, designs for this building reflect an academic building that has a 30,150 sf footprint and is five stories tall (approximately 70 feet, 77 feet including the building canopy). A corporate co-location building. This building is anticipated to be approximately 150,000 sf in size and could be up to 8 stories in height. This building would house approximately 100,000 sf of corporate co-location use and 50,000 sf of academic space. At this time, designs for this building reflect a corporate co-location building that has a 35,000 sf footprint and is five stories tall (approximately 80 feet). A residential building of approximately 300,000 sf for campus faculty and students. This building is anticipated to be up to approximately 30 stories in height (approximately 320 feet) with current designs showing a 10,800 sf footprint. An Executive Education Center. This building would be approximately 170,000 sf in size with up to 225 hotel rooms. The conference facility would occupy approximately 25,000 gsf of the building. It is anticipated that the hotel would rise up to approximately 17 stories (200 feet) and have a 20,500 sf footprint. Approximately 10,000 gsf of campus-oriented retail would be included on the site and could include uses such as a restaurant, cafés, newsstand, or bookstore. The central utility plant would house in-coming utility services and provide space for centralized electric production or co-generation facilities. As discussed above, Cornell has set a goal to achieve net-zero energy consumption for its Phase 1 academic building. To meet this goal, an array of photovoltaic (PV) panels may be constructed above the roof of the academic building; it may also extend over a portion of the central spine (creating a canopy), and possibly continue over the roof of the corporate co-location building (see Figure S-6). The entire Cornell NYC Tech EIS is here. It is voluminous with lots of information about the project. ... 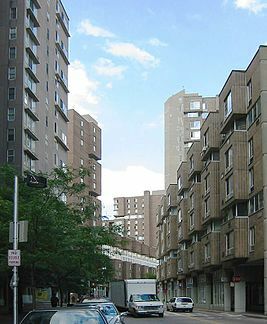 The island is traversed by one central road, Main Street, and accessible by car by the Roosevelt Island Bridge, which connects it to Queens. University officials said they planned to bring construction and demolition materials by road, rather than barge, which they said would greatly increase the cost. That could turn out to be the most controversial aspect of the project. Noise from garbage trucks is already a problem, as is gridlock, said Frank Farance, 54, the chairman of the planning committee of the Roosevelt Island Residents Association. Still, Oscar Hernandez, the manager of Nonno’s Focacceria and Pizzeria on Main Street, was hopeful. “We expect to have a lot more business with Cornell,” he said. Mr. Hernandez said he was not concerned that the campus would have cafes open to the public. “We make good food here,” he said. 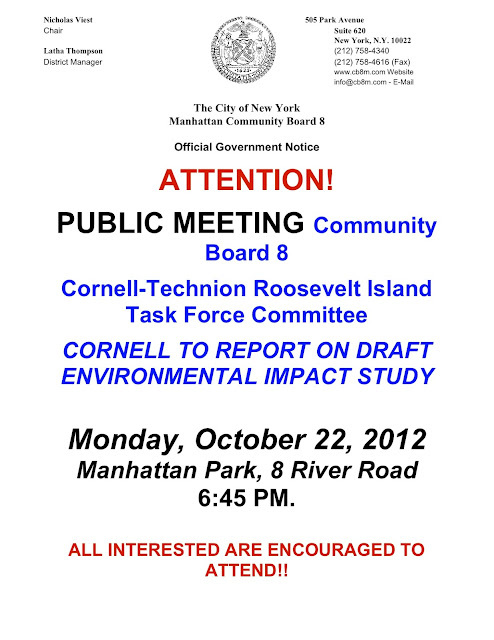 On October 22, Cornell will present their plans to the Community Board 8 Roosevelt Island Task Force at the Manhattan Park Theater Club on Roosevelt Island. UPDATE 10/16 - WCBS TV video interview with Roosevelt Island residents on Cornell NYC Tech project.